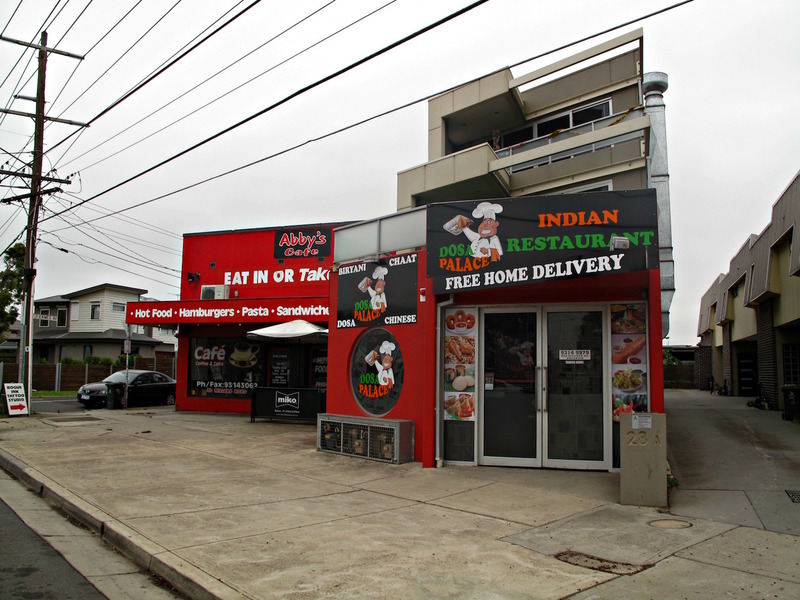 The Lohse and Hall Street shops are tucked away, over the train tracks and about a kilometre from Laverton’s main shopping area, around Aviation Road and Cheeky Chewies Cafe. Very local, very low key. There was a couple of Indian places here we never visited. 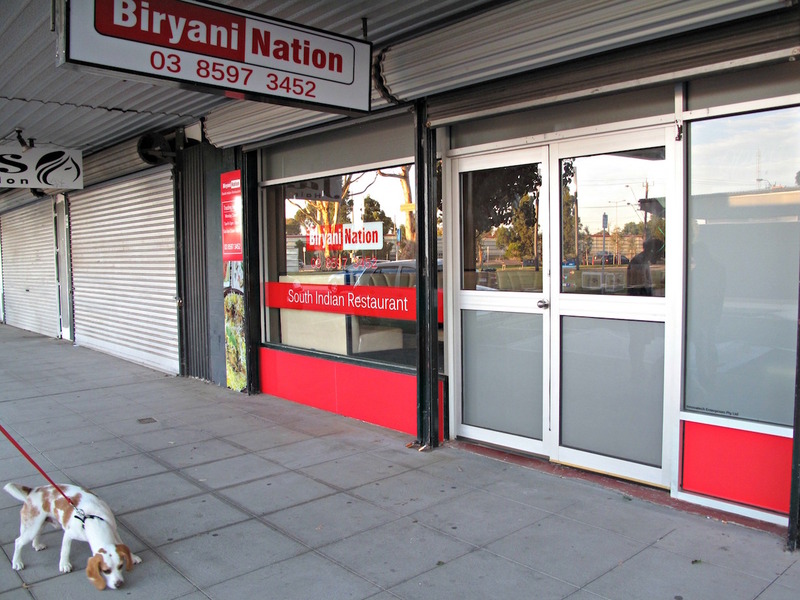 They’re gone – and now there’s just the very brand new Biryani Nation. 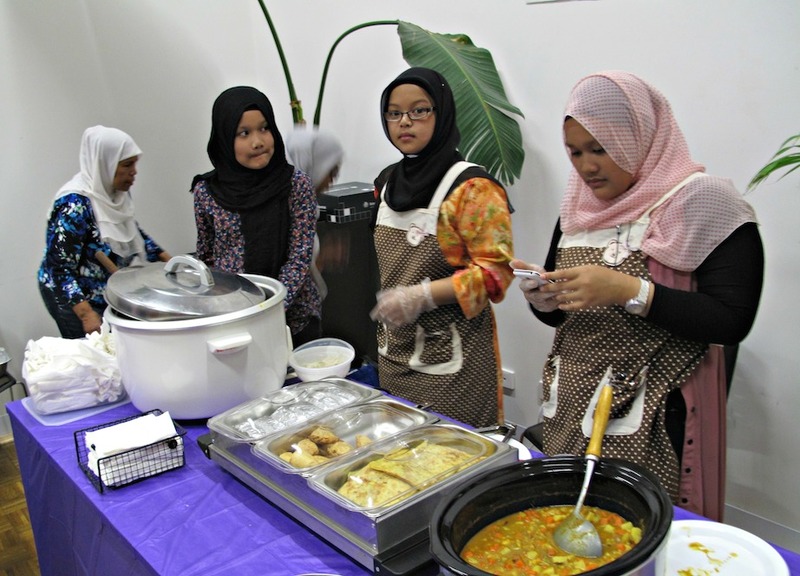 With a name like that, you’d want to be pretty darn good at cooking … biryanis. 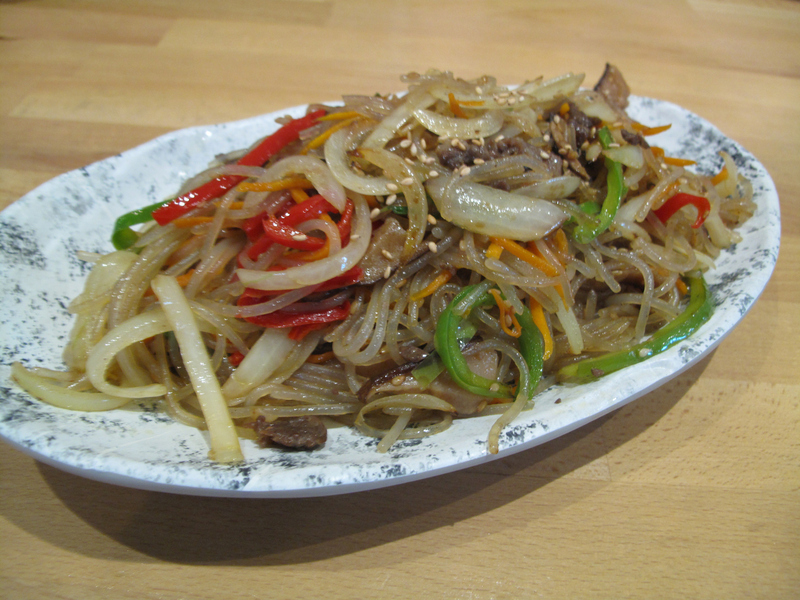 Certainly, the menu makes a big deal out of this sub-continental rice dish – there are about 30 of them, including vegetarian options, listed (see below). 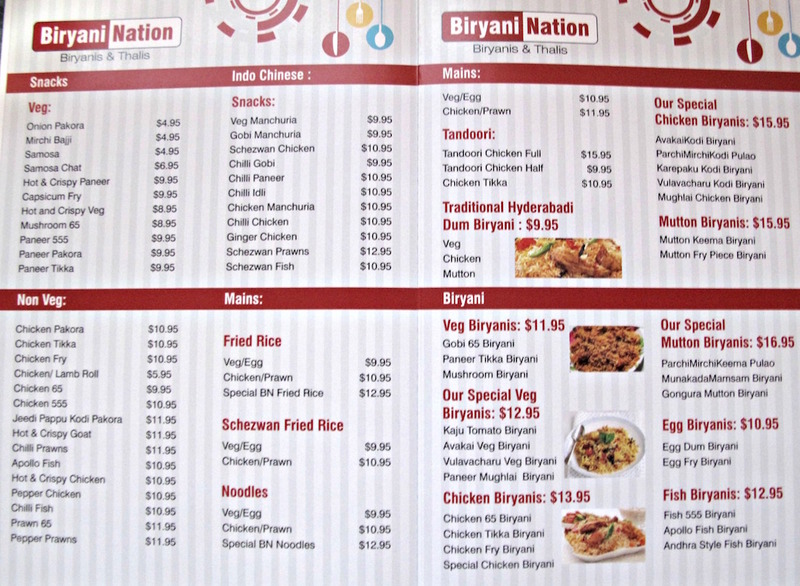 Apart from the regulation and expected dum biryanis – in which the meat is cooked with the rice – I suspect many of the Biryani Nation dishes could more accurately be labelled as pulaos. That’s of no matter to me – I’m not about to get into hair-splitting if the food is good and there is a range of flavours and seasoning among the various biryani selections. There is – I know, because I’ve tried two of them and they were very good. 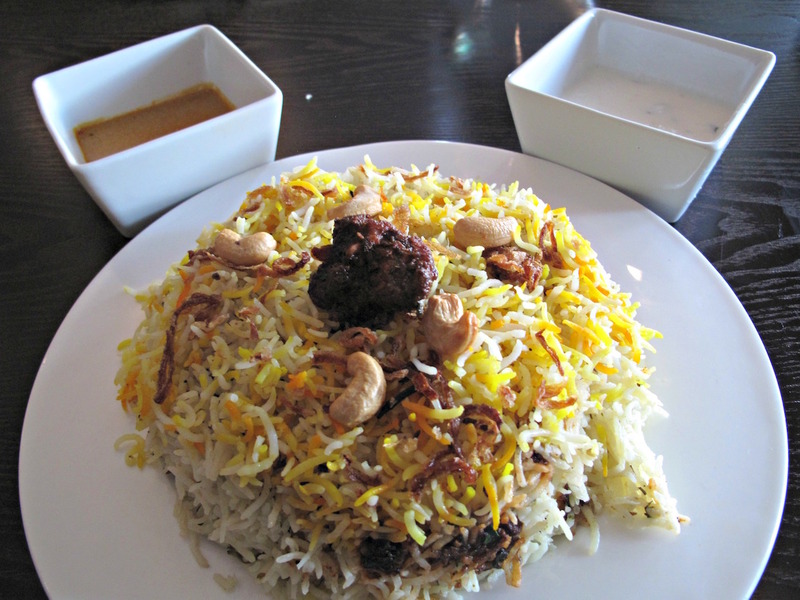 Chicken fry biryani ($13.95) has crunchy fried onions, cashews, curry leaves and plenty of meaty, chewy chicken pieces on the bone. The accompanying gravy (tastes peanutty but is, I’m told, cashew-based) and raita are served in admirably hefty quantities and are excellent. 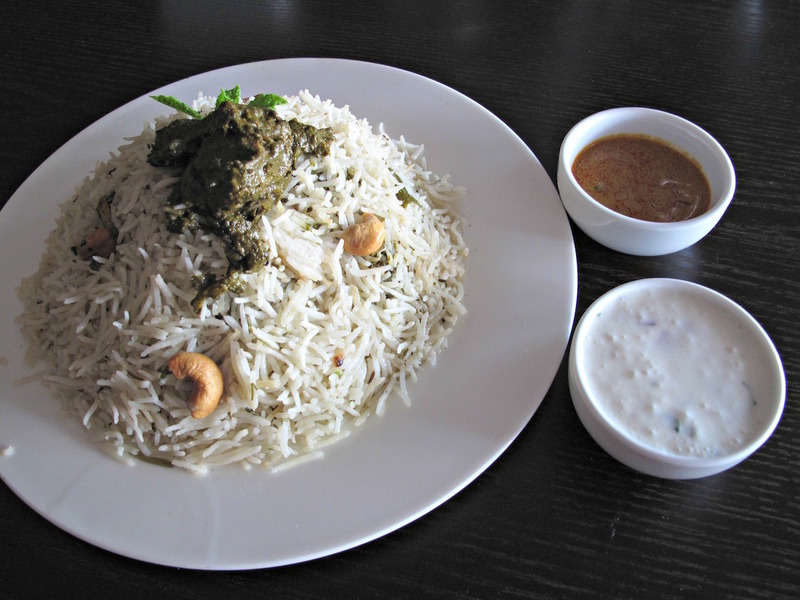 Gongura mutton biryani ($16.95) is more in the pulao style – but is a knockout. Gongura, I find out, is a leafy vegetable widely used in India – it’s basically sorrel. Here, as in saag/spincach dishes, it is used as a puree marinade cooking medium for the mutton, one piece of which crowns my rice pile and many others of which are buried within. Some of the mutton pieces are bone-free and wonderful. As many more are on the bone and rather tough – but I like it like that, getting fully into the hands-on swing that very much goes with this sort of territory. The big thing is the flavour – the gongura produces a zesty, citrus-like tang like I’ve never before experienced in Indian food. So much so, that I use the raita only sparingly, and the gravy not at all, in order to enjoy the leafy puree all the more. 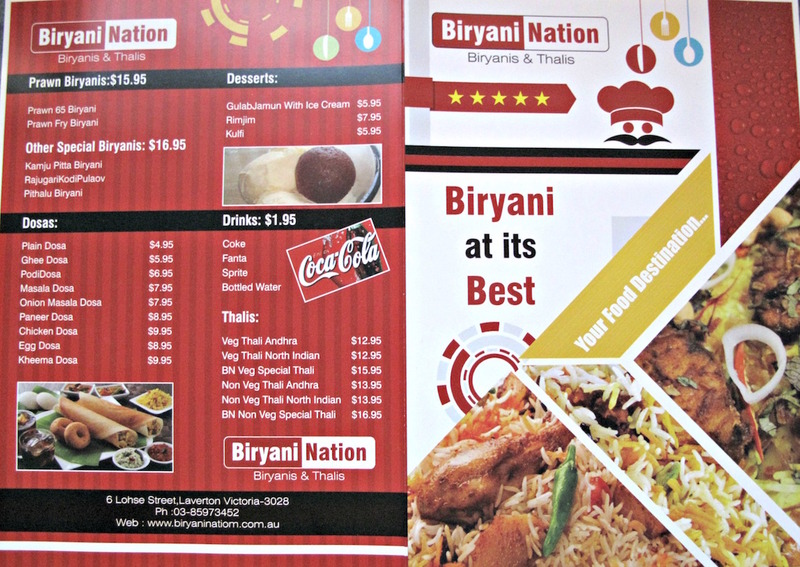 For non-biryani fans, there’s plenty of scope for enjoyment elsewhere on the Biryani Nation menu – dosas, Indo-Chinese, thalis. 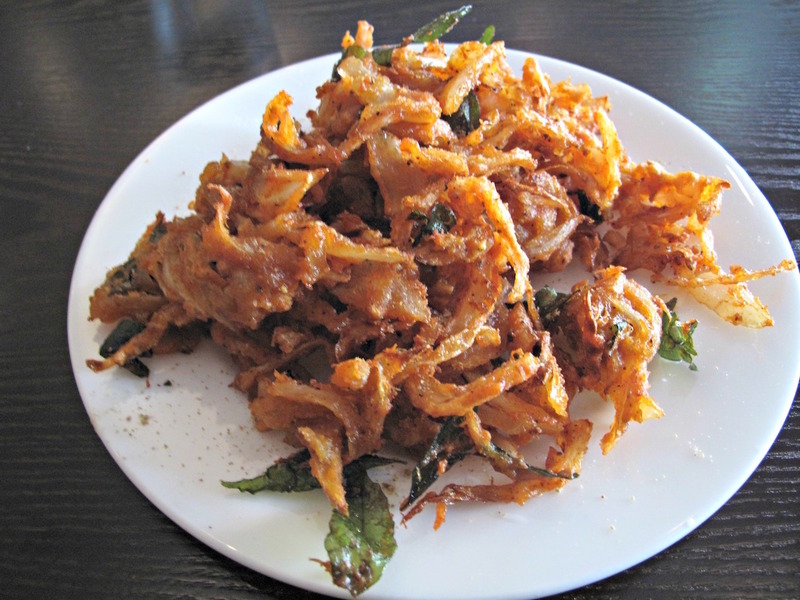 These onion pakora ($4.95) are beaut with their crunchy batter and curry leaves. I am presented, complementarily, with this amazing double ka meetha on account of it being opening day. They should put it on the menu! It’s an Indian take on bread pudding, the white sliced bread all puffed up with milk and perfumed with saffron and cardamom. Topped with chopped almonds and pistachios, it’s a killer treat. 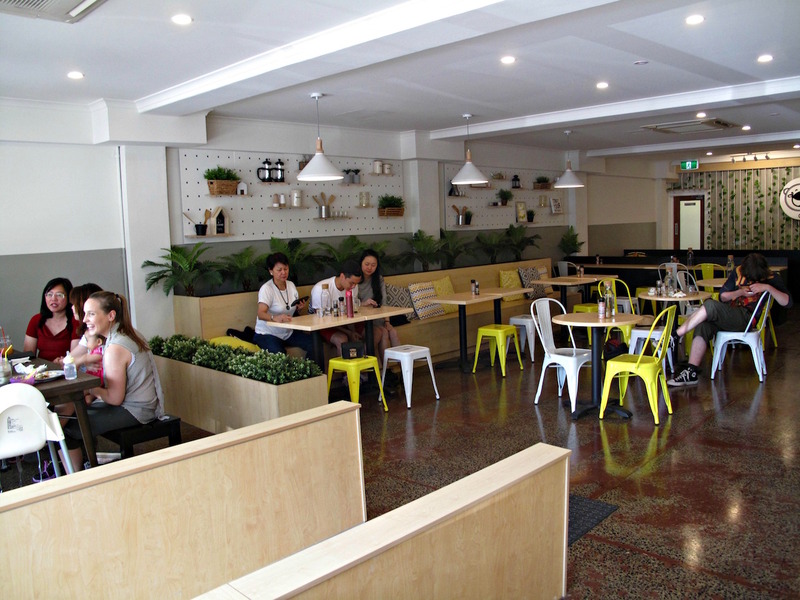 We’ve been won over by this concept, particularly by West of Kin in Braybrook. 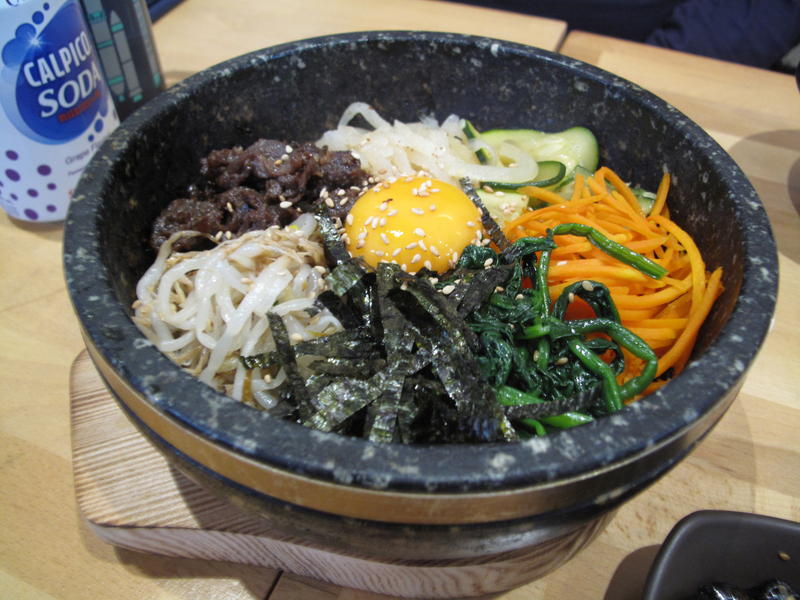 But there, the food is ambitious and the prices tend to reflect that. 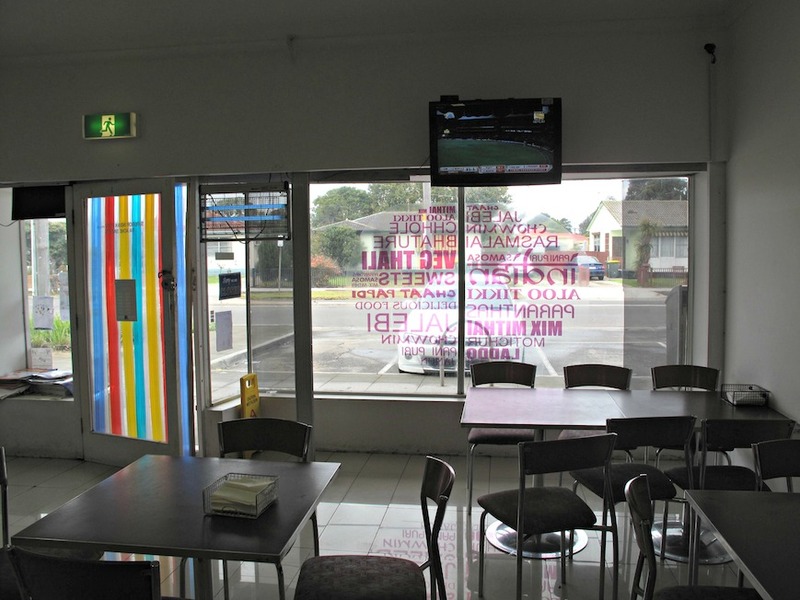 At Cheeky Chewies, a bright new arrival in Laverton, the vibe is more everyday cafe, with asking prices to match – there’s nothing above $20 and most of the more hefty dishes clock in at about $16. 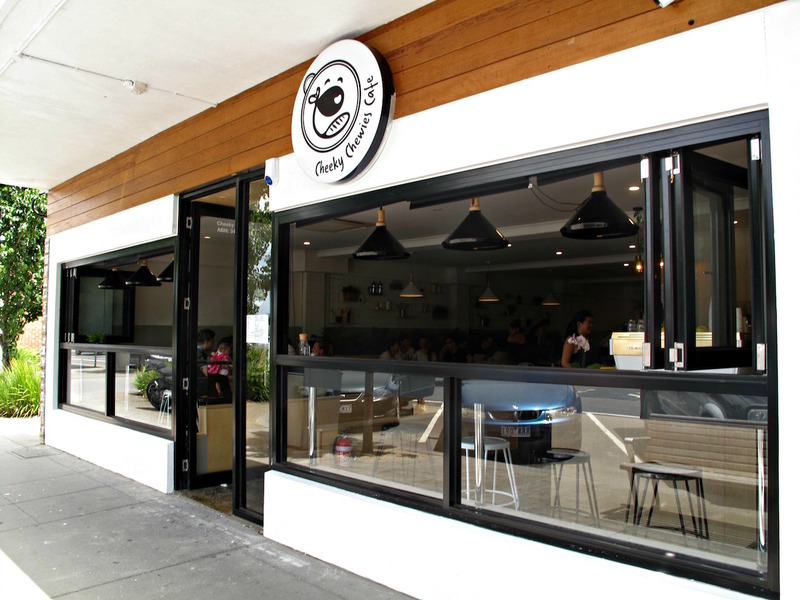 Actually, while Cheeky Chewies is self-described as offering “Asian fusion”, truth is this place is more about mixing, on the one hand, Western-style fare (a parma, fish and chips) with, on the other, pretty much straight-up Asian offerings. Over two lunches on successive days, Bennie and I eat very well indeed, with only a couple of minor flat spots. The service is top-notch and we like this place a lot. 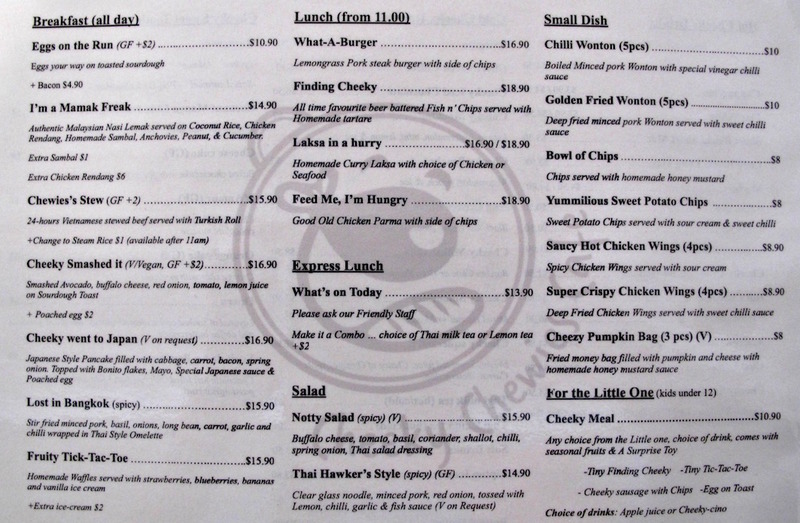 On our first visit, we tackle a bunch of the “small dish” offerings listed on the menu (see below). 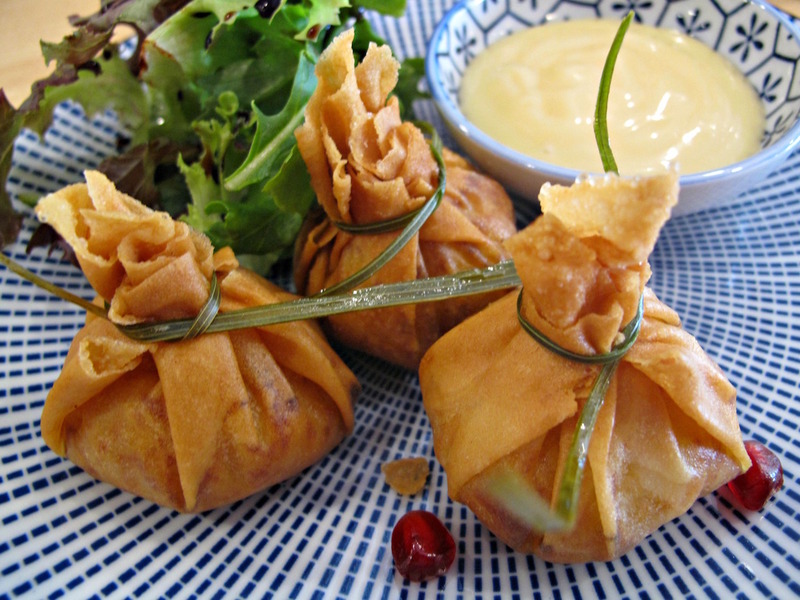 Chilli wontons (top photo, five for $10) are dynamite, the delicate casings housing a lovely pork mince filling, with both doing a lovely tango with the zingy vinegar chilli sauce. 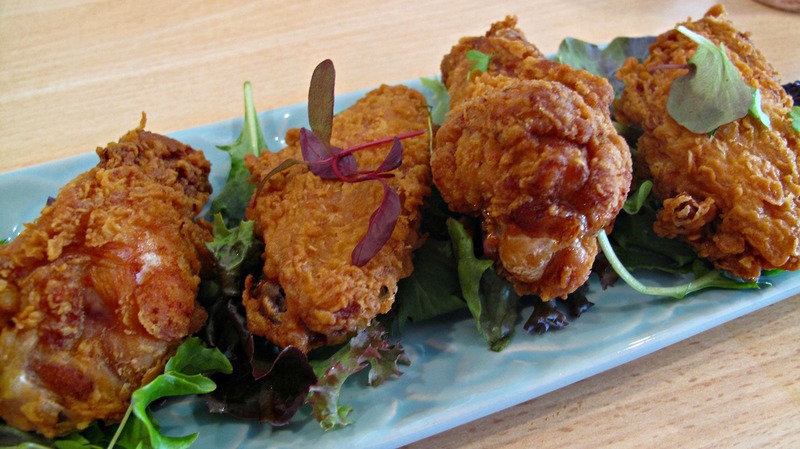 “Super Crispy Chicken Wings” (four for $8.90) could more accurately be described as wingettes, but are excellent. 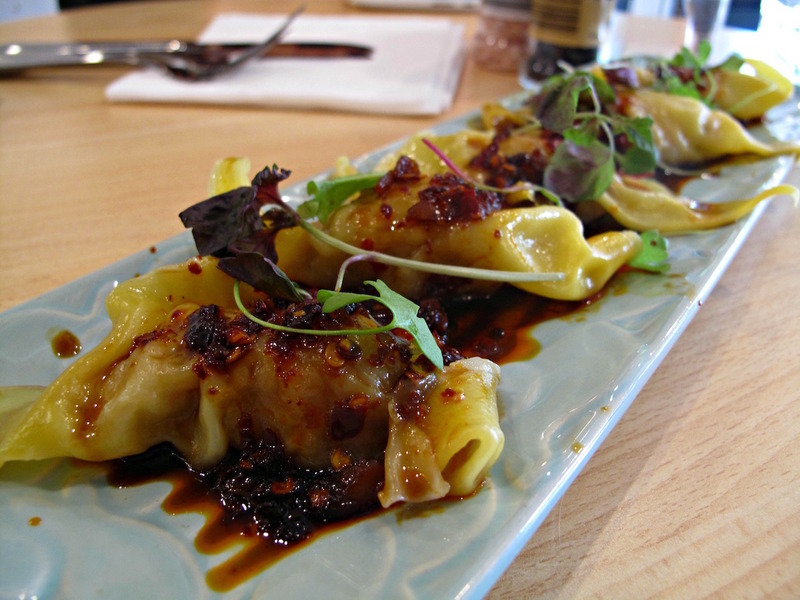 Nothing flash is served up here – simply superbly cooked, unoily chook. My heart sank a little when I saw a bottle sweet chilli sauce being wielded in the kitchen, but thankfully that jam-like concoction is served on the side and is ignored. “Cheezy Pumpkin Bags” (three for $8) display the same expert frying skills, but we detect none of the advertised cheesiness – just pumpkin. And the dipping sauce tastes like plain old mayo to us, though we are assured it really is “homemade honey mustard sauce”. The lesson here for Bennie and me is, I suspect, never order anything involving pumpkin. 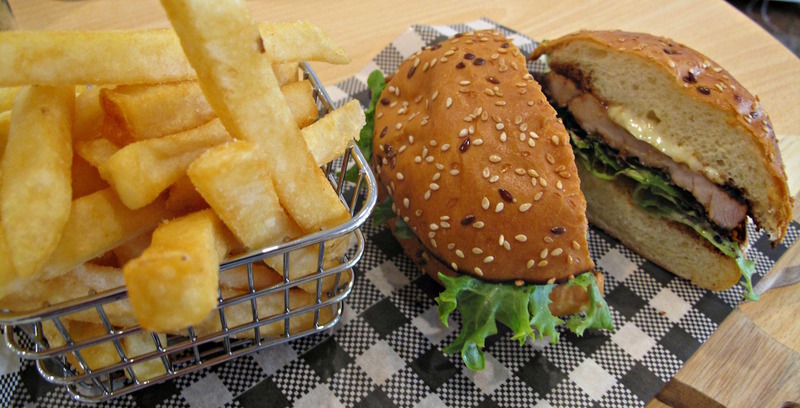 The “What-A-Burger” ($16.90) is OK, the nice slab of pork having a good lemongrass kick. But for the price, this offering seems a little on the austere side when there are so many high-powered burger options across the west at similar prices. 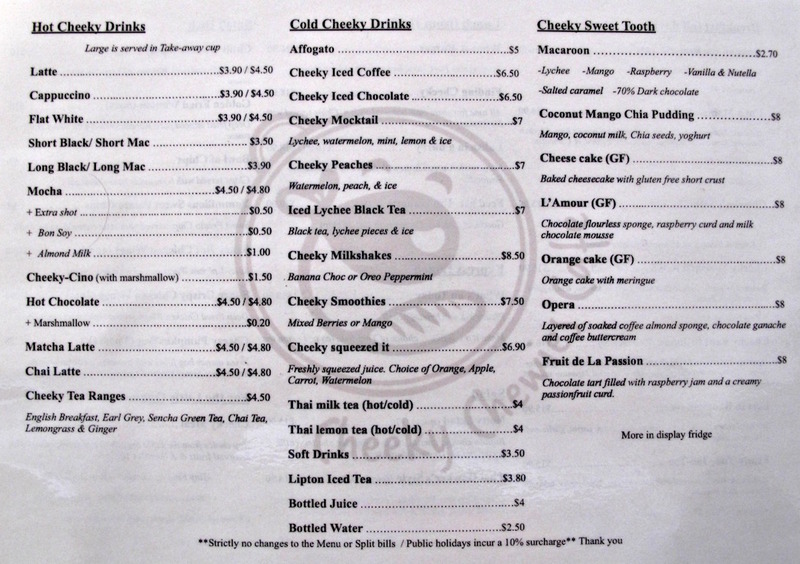 The Cheeky Chewies nasi lemak ($14.90) is listed in the breakfast section of the menu, but can also, of course, do lunch duty. 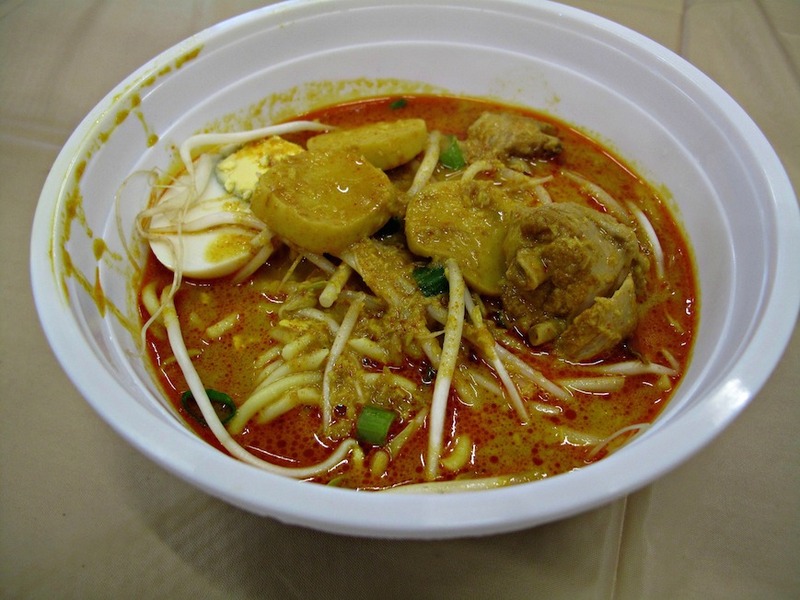 It’s wonderful – better, fresher and more interesting than most equivalents you’ll find in regulation Malaysian eateries. 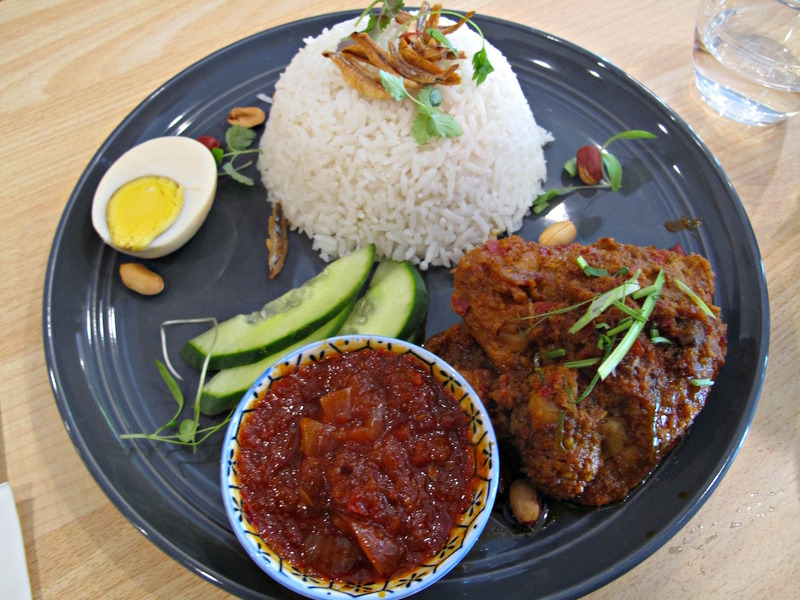 If there’s one thing that prevents nasi lemak being as popular with us as, say, pho or Hainan chicken rice, it is the inclusion of anchovies. Invariably, they seem to us stale, nasty blemishes. Here at Cheeky Chewies they are prepared in-house and the result is winning. Blonde and crisp, they enhance the dish. The sticky chunk of chook rendang is fine. But the real triumph is provided by the house-made sambal. 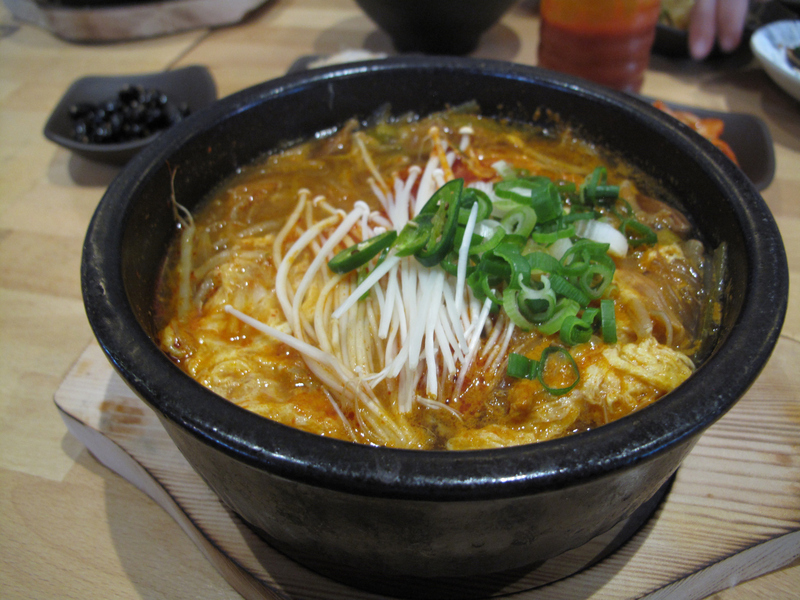 It’s of only mild spiciness, but has a rich, deep flavour with a touch of smoky about it – wonderful! 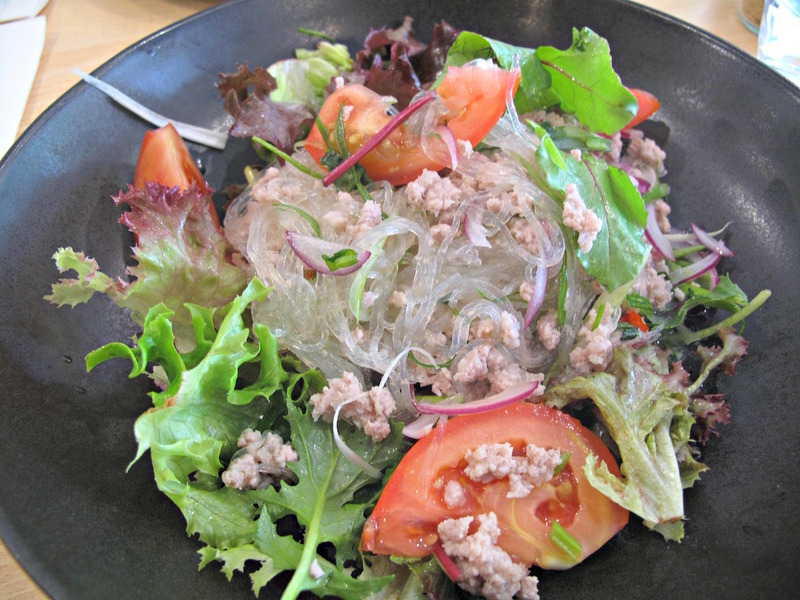 Our Thai-style pork/noodle salad ($14.90) is a quality assemblage of excellently fresh ingredients with the just the right, spirited mix of chilli and lemon. The cafe lattes ($3.90) that complete our second meal here are superb. Consider The Sauce enjoyed its visit with the Urban Ma to new CBD joint Delhi Streets – the food we had was good. But I have been bemused, but not surprised, by some subsequent reviews of the place. 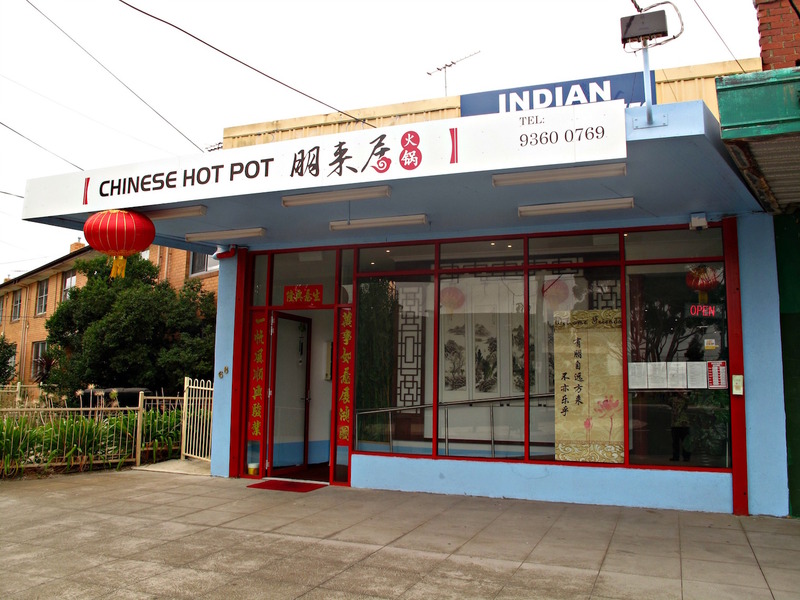 More precisely, I’m bemused that the place’s publicity is being bought into to such an extent that it is being put about that Delhi Streets is doing something edgy and adventurous in “bringing Indian street food to Melbourne”. I feel this is misleading as just about everything Delhi Streets serves has long been available across Melbourne, including West Footscray, Werribee and elsewhere. 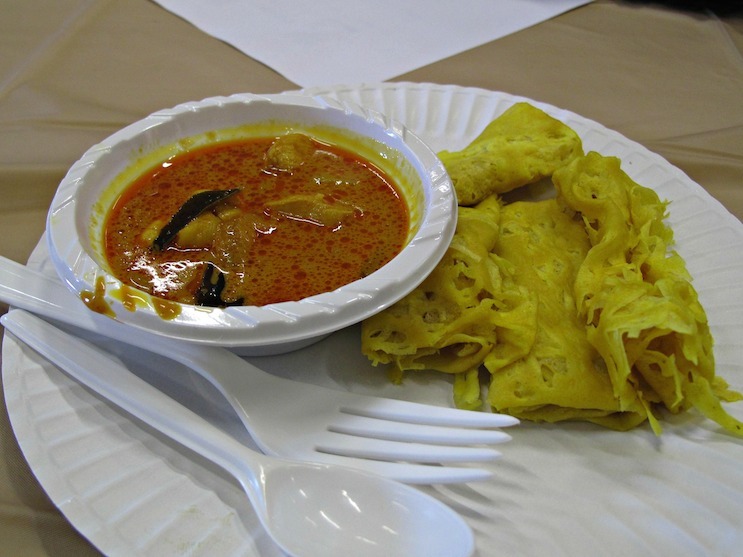 The places that do Indian street food can sometimes be businesses of the more regulation Indian variety that have dosas, chaat and the like on their menus – but they’re also often humble shops that do little more than serve snacky Indian treats and have overwhelmingly Indian customers. A-One Sweets is one such place. 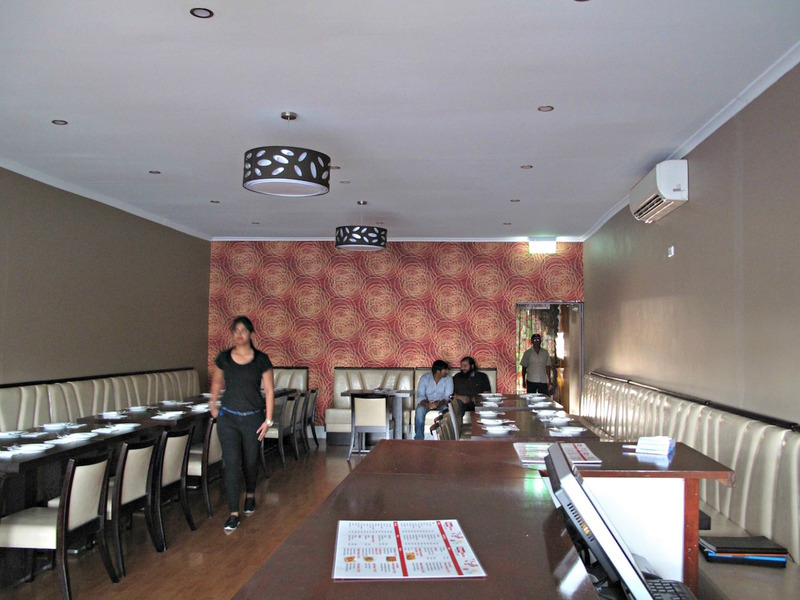 Like so many of its kind, it’s a bare-bones Indian cafe – with lots of sweets of course! 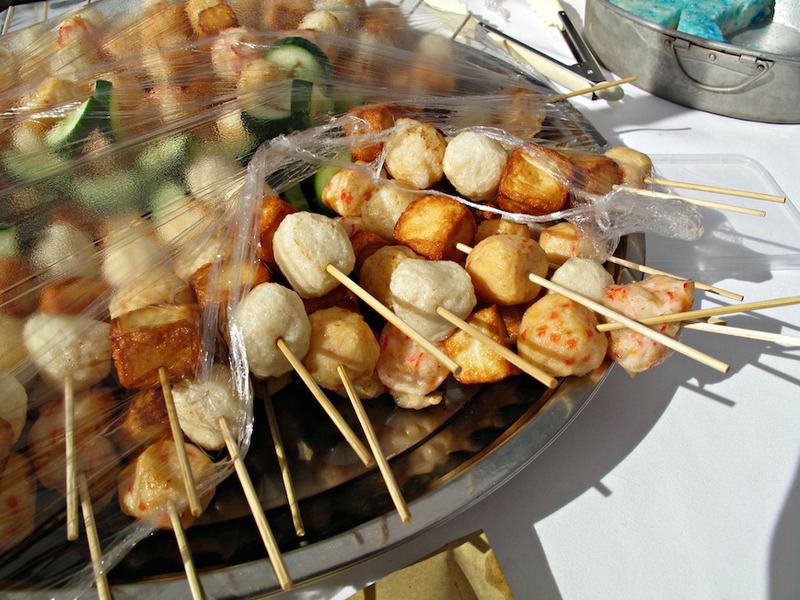 But they do a nice, simple and very cheap line of snacks such as aloo tikki and pani puri. There’s also a vegetarian thali and paranthas stuffed with gobi, aloo or paneer and served with butter, yogurt and pickle. 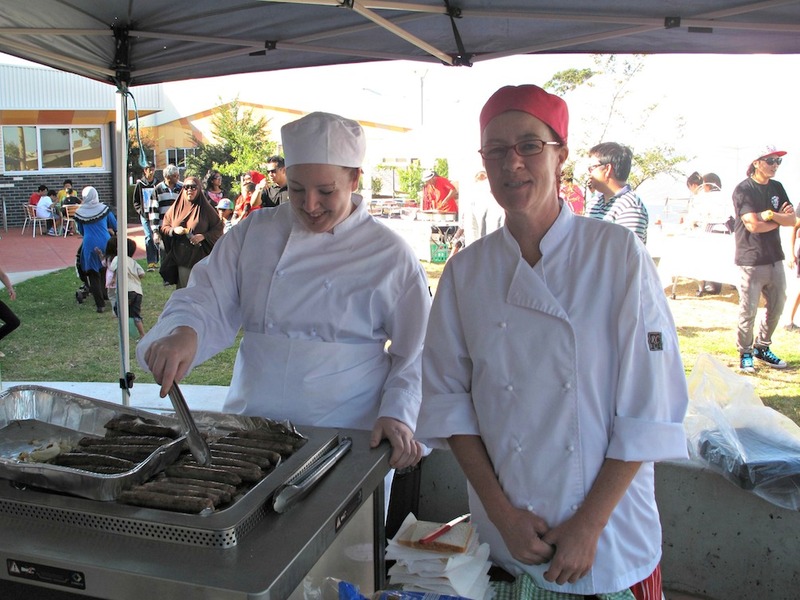 I’m actually in Laverton to do some volunteer duty on the West Welcome Wagon sausage sizzle at the market at the Woods Street Arts Space. But I know that if I turn up for tong duty on an empty stomach, I’ll end up eating about a dozen of those $2.50 suckers. And while I’m partial to a sausage sizzle snag in white bread, I most certainly do not want to make a meal of them, so to speak. 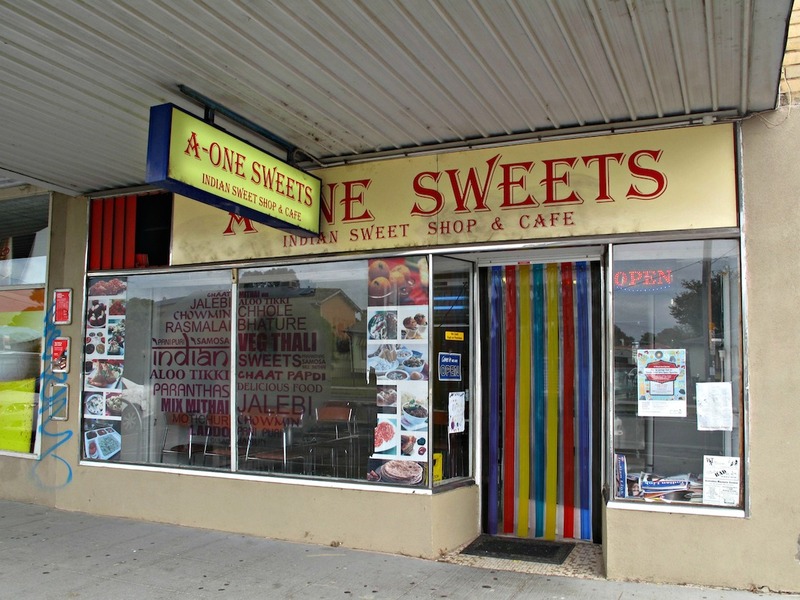 So I venture to the Bladin Street shops a few blocks away and into A-One Sweets, which has been on my to-do list for a while. 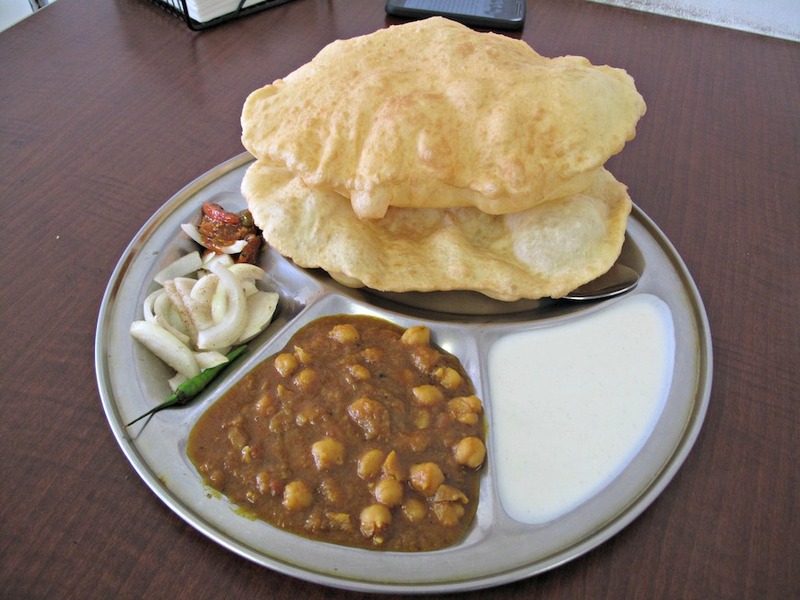 I tell the nice man behind the counter, as I peruse the menu, that I feel like something other than chole bhature – that, indeed, I’ve had that fabulous Indian dish at many places festooned across the west. He’s persuasive, I say “Yes!” and I’m ever so glad I do. My $9 meal is a doozy. The breads are puffed up like footballs and ungreasy. 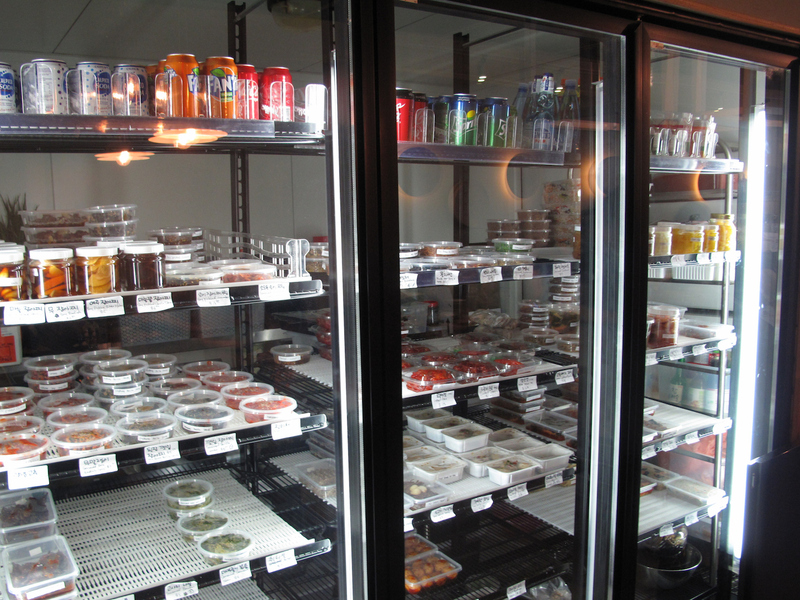 There’s plenty of yogurt to join the regulation raw onion slices and commercial, tangy pickle. Best of all, the chick pea curry is very nice indeed. I love it and pretty much leave my thali tray clean. From there it’s back to Woods Street to join my fellow WWW sausage sizzle volunteers. It’s great to meet and swap notes with some fellow westies. 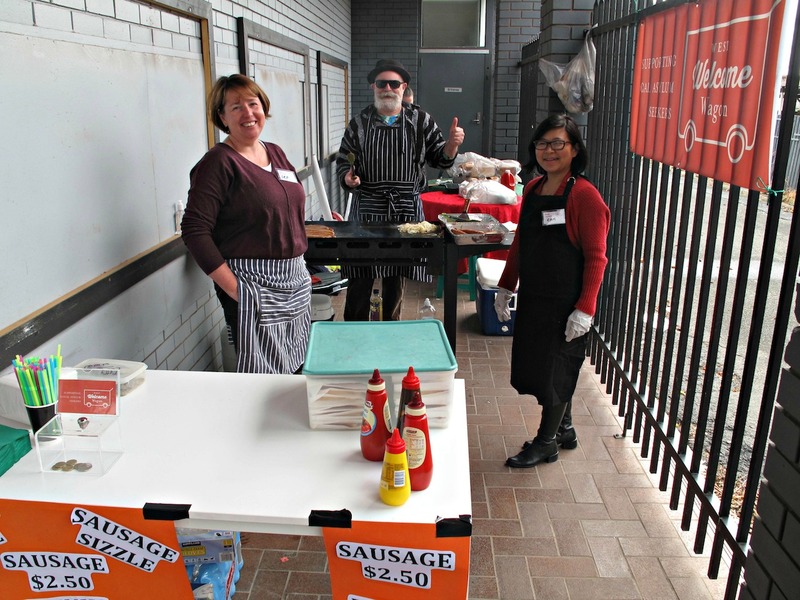 We sell a heap of snags and make some good cash money for West Welcome Wagon. Everything I am wearing, though, will be going straight into the laundry basket! 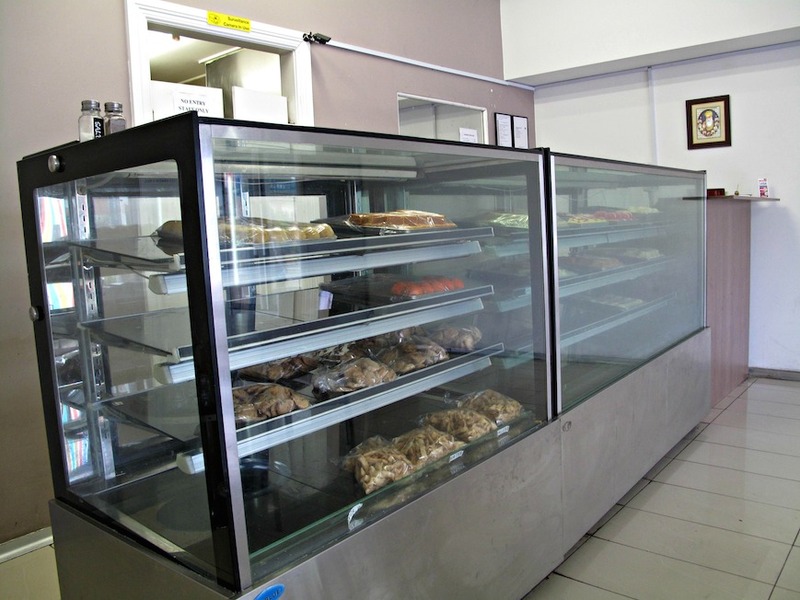 A-One Sweets is one of those gems of places away from the main drags and shopping centres that are an outright pleasure and thrill to stumble upon. 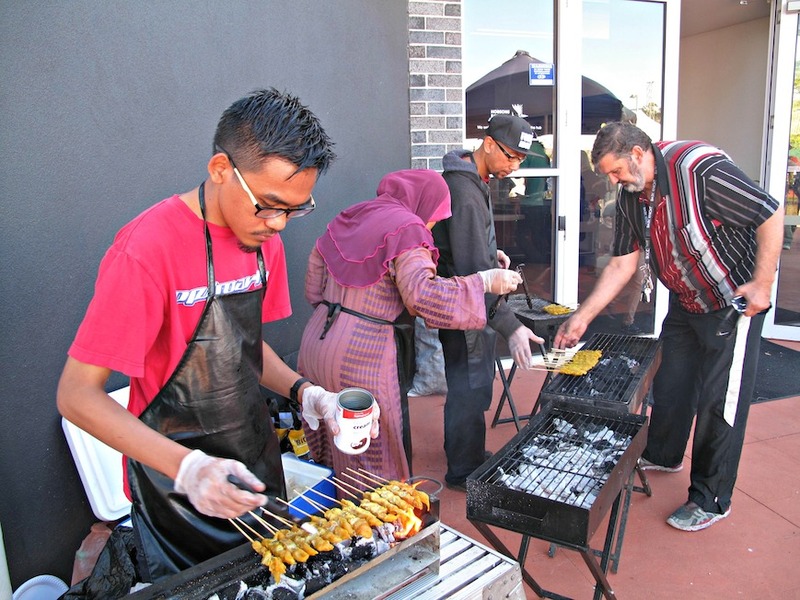 Consider The Sauce is happily falling into the happy routine of always, whenever possible, attending MiHub functions at the Laverton Community Hub. Where else would we want to be early evening on a Saturday once a month? But I suspect there is a limit beyond which reader endurance and loyalty should not be prodded in terms of recording each event. There’s a fine line between giving context to food reviews and stories by interweaving other aspects of our lives into CTS on the one hand and overdoing it on the other. So this may well be the last MiHub story for a while … although I will for sure continue to post MiHub notifications on the CTS FB page and continue to recommend all and sundry give MiHub activities a go! 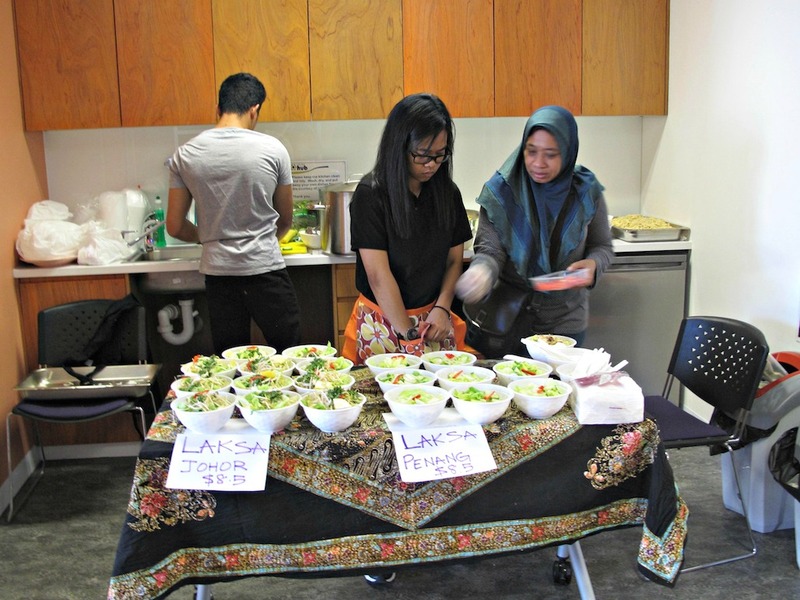 The “pop-up market” in this case was a part of Diversity Week, so there was a heap of people and a heap of food. 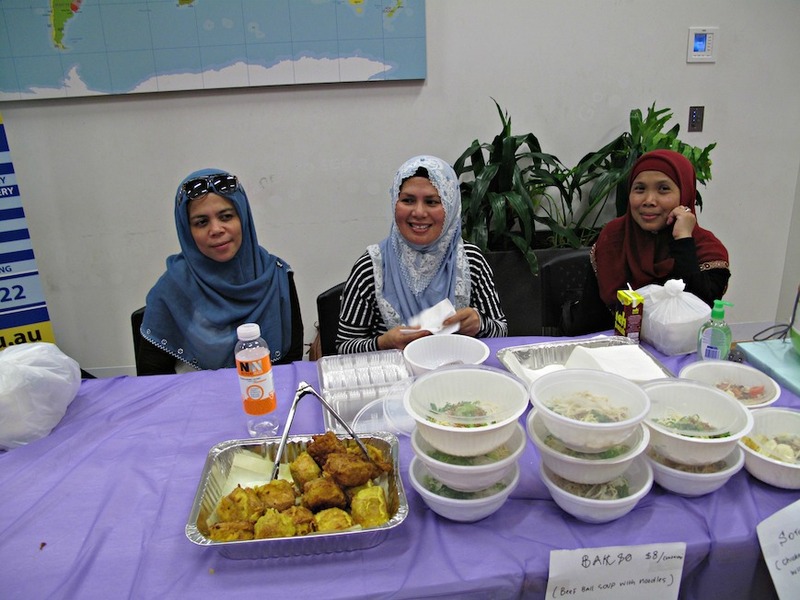 The theme was ostensibly Malaysian – but there was also Middle Eastern sweets, Indian tucker and Afghani fried chicken. 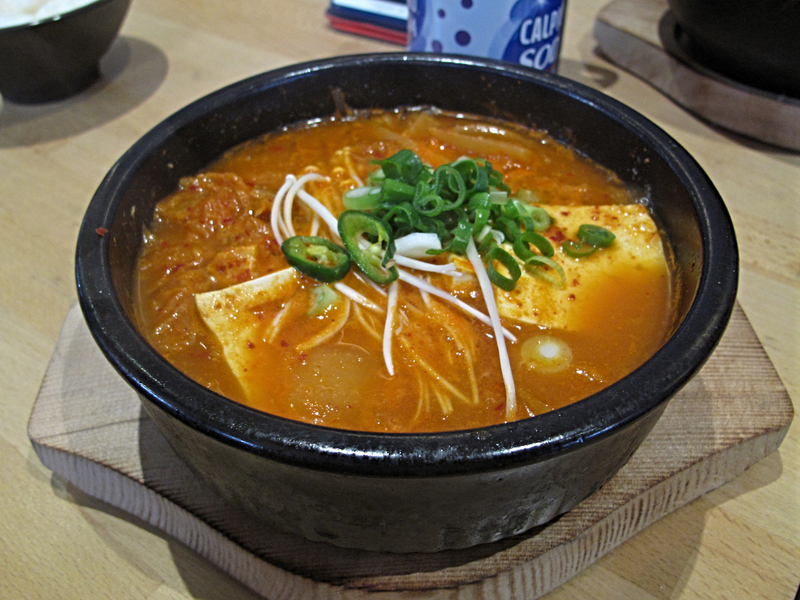 I ate well and widely. And I just loved meeting and talking with all sorts folks. 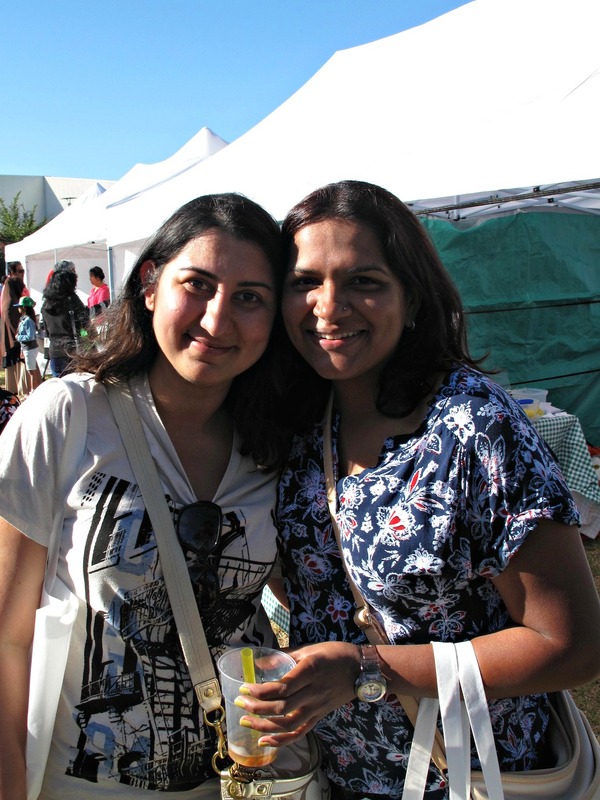 … and Roopi and Jaspreet. As well as my Star Weekly colleague Karen, her hubby Chee (on the right) and their friend Sharil! 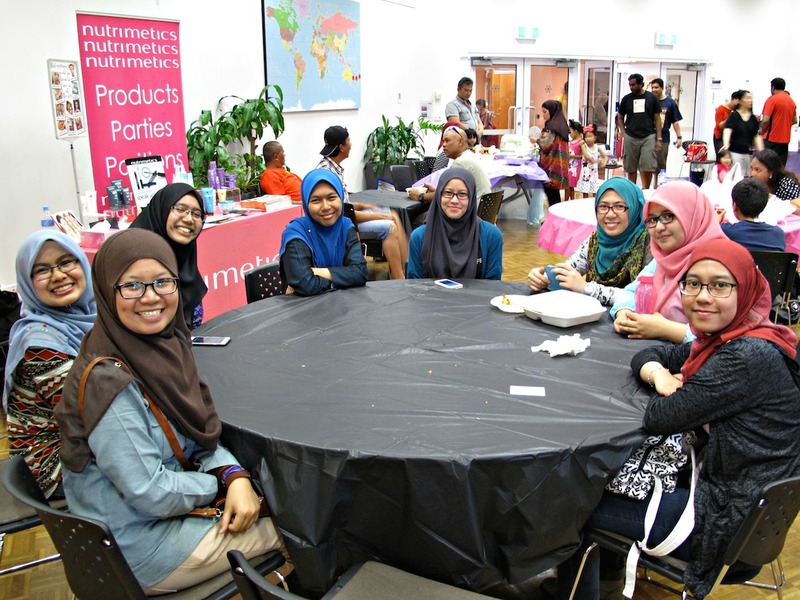 CTS enjoyed chatting with this happy and livewire bunch of young women. 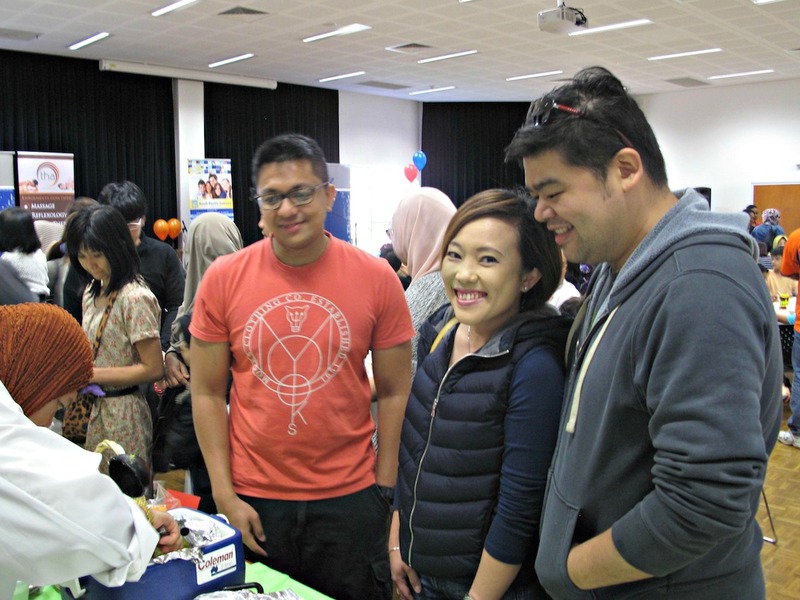 They’re all from Malaysia, all friends, have all been studying – on scholarships – at Melbourne University since July. As such, they’re apartment dwellers but were very happy to have collectively made the train trip to Laverton for “a taste of home”. 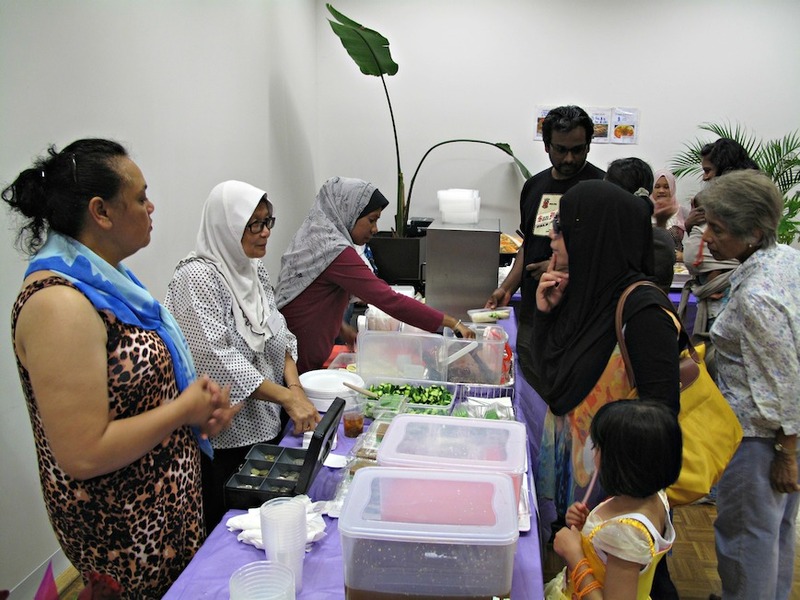 MiHub Night Market, Laverton Multicultural Hub, 95-105 Railway Avenue, Laverton. 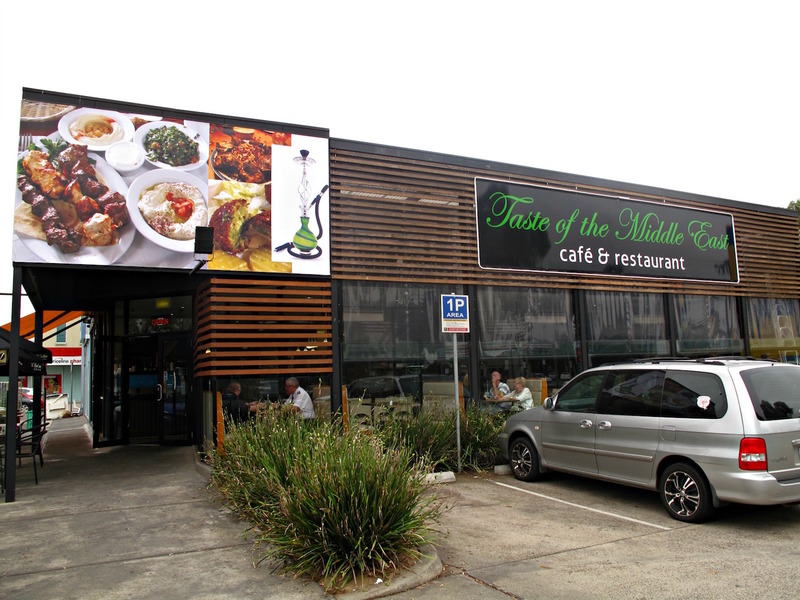 After its premises was sold under it, some doubt surrounded the future of the MiHub institution. 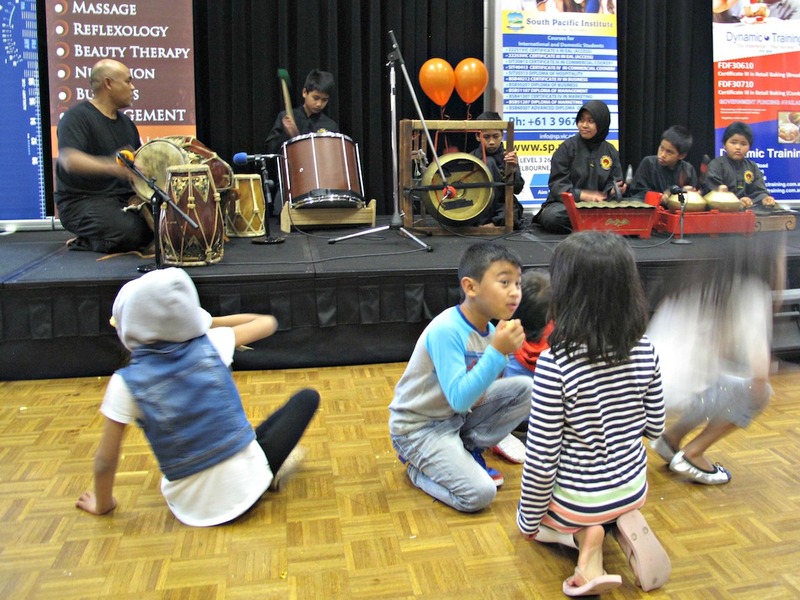 So it was a happy hoot to attend its latest incarnation – as a “night market” at Laverton Multicultural Hub. 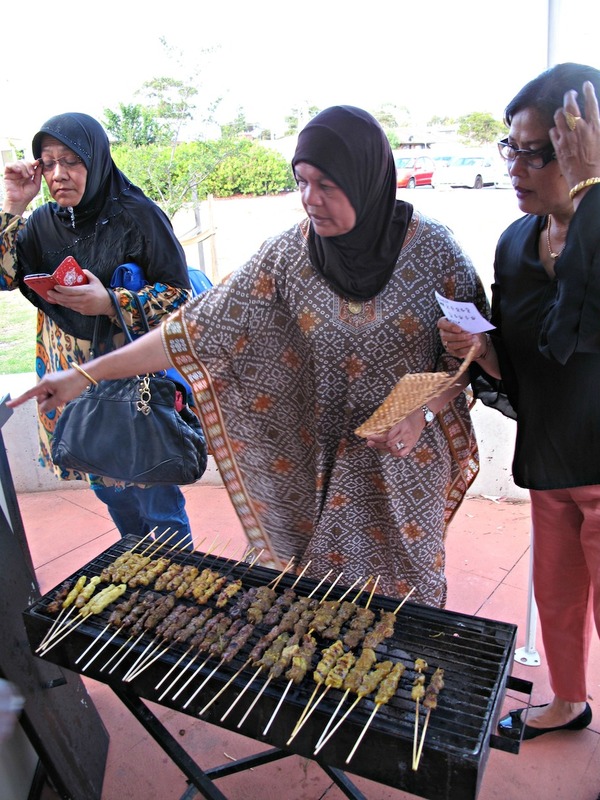 Best of all, the new night market set-up will continue on a near-monthly basis for the rest of the year. 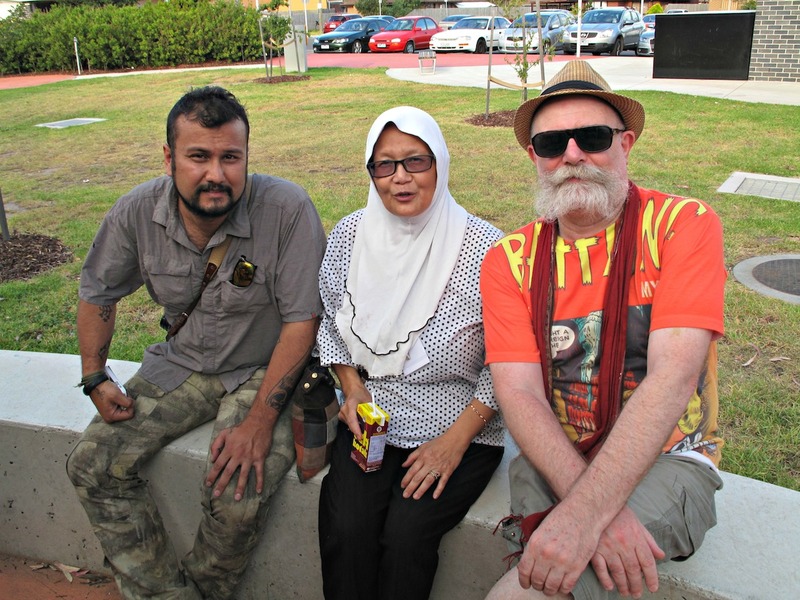 CTS was delighted to run into several readers who had rocked up in response to our preview story earlier in the week as well as a number of other friendly faces. However, gauging by the number of people story checking that story out online, I fear some may have turned up quite late in the day and after I had departed. Truth is, while the advertised ending time was 9pm, just about all the food had been sold and eaten by about 7pm. 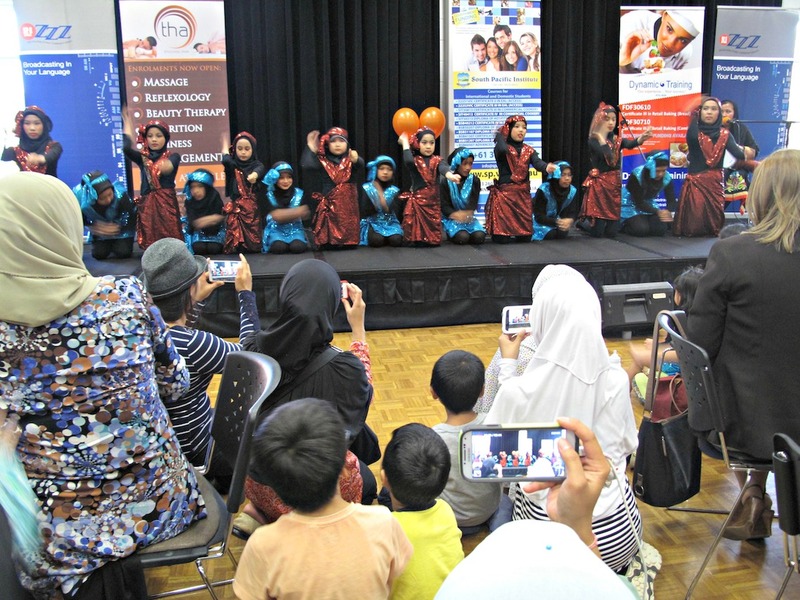 Please keep in mind, this is a community initiative run by volunteers – not a professional, commercial festival or market that will cost you hefty admission fee or involve an hours’ worth of waiting in queue. 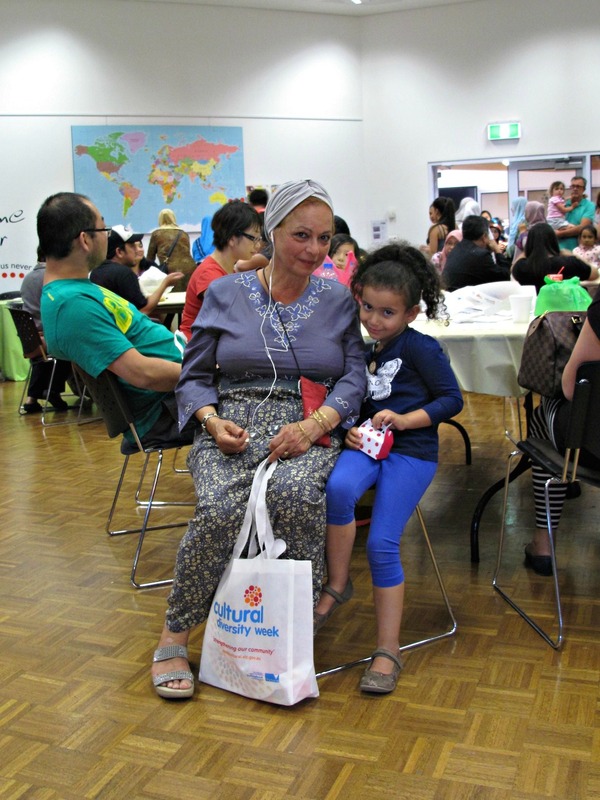 Aunty Nora has enthused to us that future 2015 MiHubs will be better and bigger and include music. Turning up early is probably a good idea! If all goes as tentatively planned, CTS will be on board as willing workers next time out in a dish-washing bid to introduce real crockery and cutlery to proceedings. 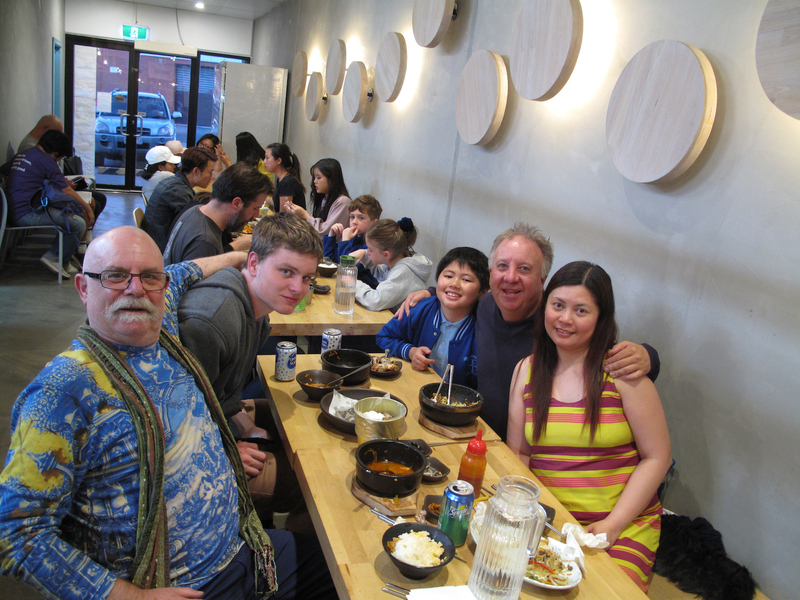 Among the attendees were dad Kelvin, mum Susan and boys Brendan and Ryan. 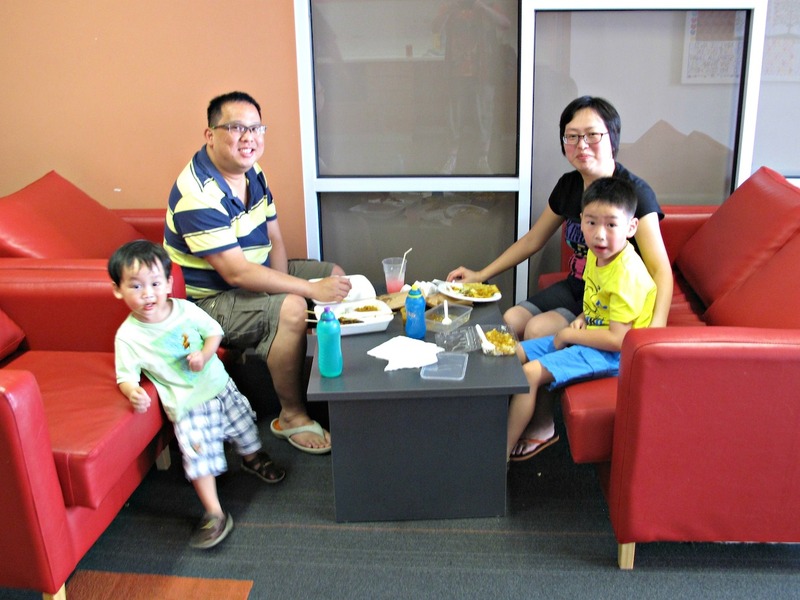 For this Tarneit family, the Laverton venue was the fourth at which they’d attended MiHub festivities. 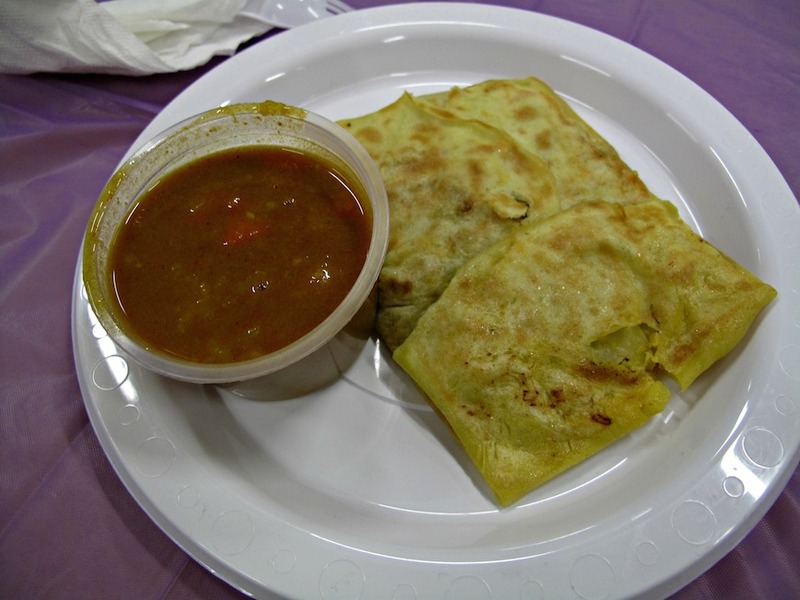 I really enjoyed my superb, freshly-made murtabak with a slightly spice but very nice beef/vegetable stew. 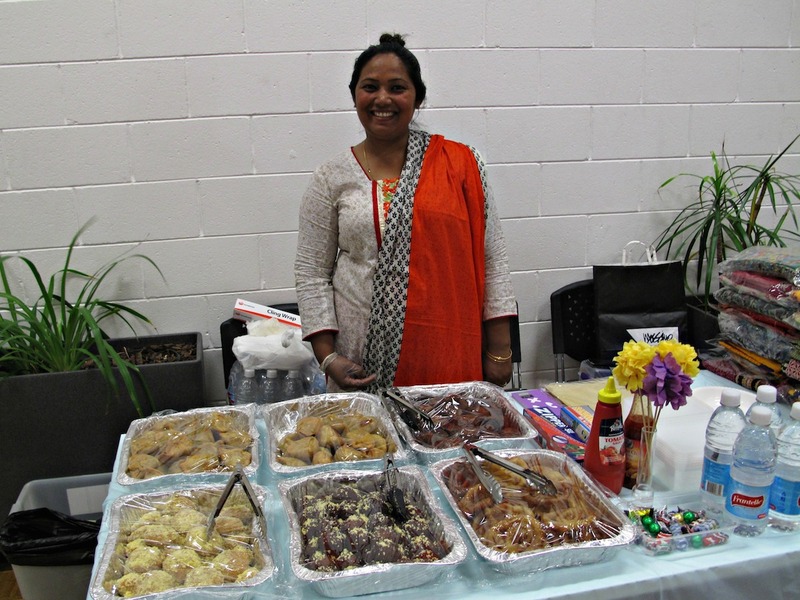 And I loved, too, the delicate tuna patties, samosas and gulab jamun created and sold with a big smile by Masuma. 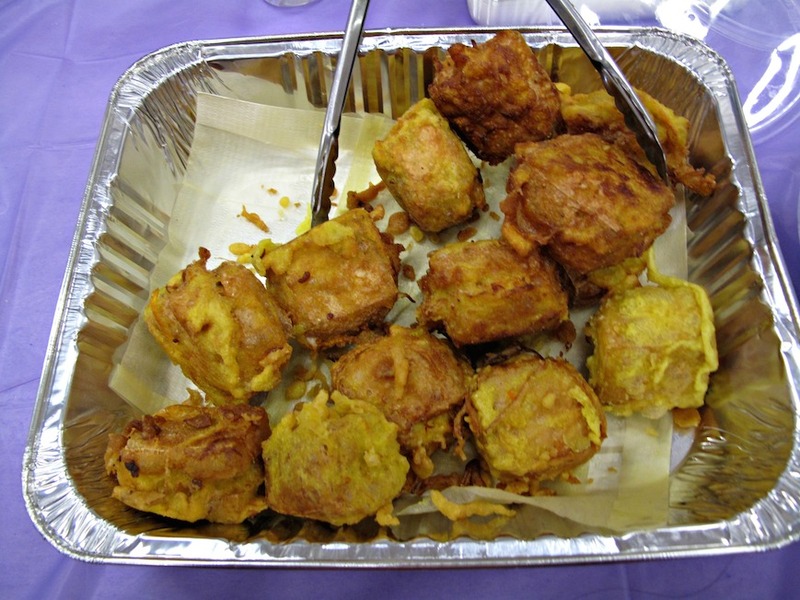 These tofu cubes had been stuffed with a garlicky mix of veg, bean sprouts and vermicelli then deep-dried to a crisp. Full of tummy and hanging out with Aunty Nora and son Jake.